The Basics What's the difference between powdered peanut butter and the traditional peanut spread most of us grew up with? It's simple: Powdered PB is made from defatted peanuts, which are exactly what they sound like -- peanuts with all the excess fat squeezed out of 'em. The end result is a dry powder rather than an oily spread. It still tastes like peanuts, because it's still made from peanuts. Brilliant! Unlike regular PB, powdered peanut butter used to be a little tricky to track down. But these days, you can find it on supermarket shelves next to the ordinary nut butters! 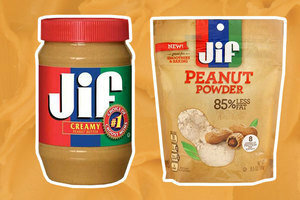 Look for powdered peanut butter made by PBfit, Peanut Butter & Co., Just Great Stuff, and PB2. When in doubt, order online... Here's a great deal on Amazon. The Stats Ready for this? 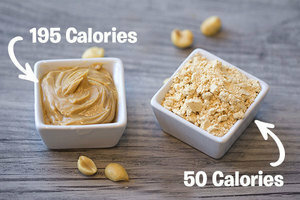 An entire 2-tablespoon serving of powdered peanut butter has about 50 calories, 2g total fat (<0.5g sat fat), 34mg sodium, 4g carbs, 2g fiber, 1g sugars, and 6g protein (SmartPoints® value 1*). The same amount of standard peanut butter, on the other hand, has around 195 calories, 16g total fat, (3g sat fat), 140mg sodium, 7g carbs, 2g fiber, 3g sugars, and 7g protein (SmartPoints® value 6*). The serving sizes aren't exactly equal -- once you mix a serving of the powder with water, you'll have 1 - 1 1/2 tbsp. of actual peanut butter. But still... The powdered stuff has at least 50 percent fewer calories and 80 percent less fat than traditional PB. That's amazing! The Possibilities You can use powdered peanut butter absolutely anywhere you'd use the regular kind; just start by mixing it with water until you get a PB-like consistency. Try it out in any Hungry Girl recipe that calls for standard reduced-fat peanut butter -- the recipe stats will be lower! Mix 1 1/2 tbsp. of the powder into a 5.3-oz. container of fat-free vanilla Greek yogurt; then top with 1/3 cup raspberries or sliced strawberries. Only about 175 calories, plus about 18g protein (Freestyle™ SmartPoints® value 5*: SmartPoints® value 5*)! Bake 3 mini fillo shells until crispy. Mix 2 tbsp. of the powder with 1 1/2 tbsp. water. Fill the shells with the PB, and top each with 5 mini semi-sweet chocolate chips. Just 95 calories (Freestyle™SmartPoints® value 3*; SmartPoints® value 3*). 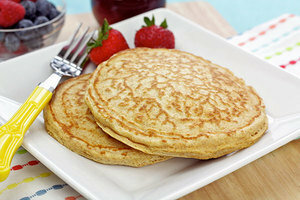 Blend 1/2 cup powdered PB, 2 cups frozen banana slices, 1 cup plain fat-free Greek yogurt, 1 tsp. vanilla extract, and 2 no-calorie sweetener packets. Fill 6 popsicle molds, and freeze. Each pop has just 103 calories (Freestyle™ SmartPoints® value 1*; SmartPoints® value 1*). Yes! Combine 1 1/2 tbsp. powdered PB, 1/4 cup unsweetened almond milk, 1 tsp. honey, 1/2 tsp. lime juice, and 1/4 tsp. crushed garlic; whisk until smooth. You'll get two servings, each with 35 calories (Freestyle™ SmartPoints® value 1*; SmartPoints® value 1*). Drizzle it on chicken, veggies... or both! Mix 1 tbsp. powdered PB, 1/4 cup light ricotta cheese, 1 packet no-calorie sweetener, and a drop of vanilla extract. Scoop it into a sugar cone for one heck of a decadent dessert... only 135 calories (Freestyle™ SmartPoints® value 5*; SmartPoints® value 5*). Hungry for More Powdered Peanut Butter Recipes? Did you know January is National Oatmeal Month? Here's a collection of oatmeal recipes with huge portion sizes and small calorie counts! Help us spread the word about powdered PB -- click "Send to a Friend" now!